The trend which has emerged in recent years of the deployment of fibre rope solutions instead of steel wire and chain for deepwater mooring solutions has been well-documented. The stated advantages of lower overall weight, easier deployment and potentially lower environmental impact using polyester rope have already been demonstrated in numerous drilling rig mooring installations. What has been less commented upon is the importance of considering the overall approach towards typical deep sea mooring installations. In the case of temporary moorings for Mobile Offshore Drilling Units (MODU), this will require either a combination of fibre rope and steel wire (Fig. 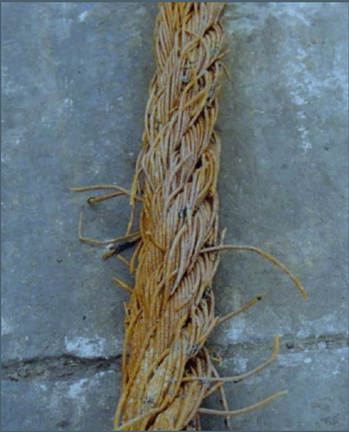 1), or a combination of steel wire, fibre rope and chains (Fig. 2). A steel wire commonly used in offshore mooring such as a six or eight strand, will have the tendency to un-twist when load is applied. A polyester rope which has been built as torque neutral is by its very nature flexible and acts like a swivel when twisted. As a result, the steel wire in combination with polyester rope will be impacted by cyclical twist to the point where a repair of the steel wire will be required by re-socketing or will even require replacement (Fig. 3). For low twist levels in a polyester rope with parallel sub-ropes, a small increase in fibre rope strength is observed. This is caused by higher friction interaction between the sub ropes leading to higher load shearing. For rope diameters 160mm and smaller, the breaking strength is not influenced by twist levels up to 0.5 turns per meter. However, a higher level of twist may eventually impact fibre rope break strength and durability. 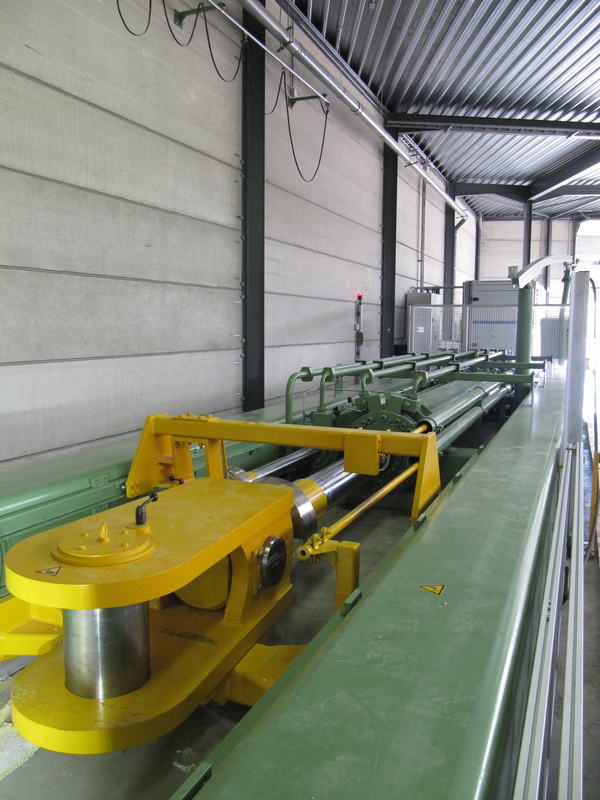 The objective is therefore to design torque-matched synthetic rope that ensures a longer steel cable lifetime. The ISO - Torque Matched - standard requirement is for rotation at the connection point between steel wire and polyester rope to be less than 5° per steel cable lay length. The first premise to take into account is that if the steel cable to be deployed is right hand lay, then a torque-matched polyester rope must also be constructed as right hand lay. Similarly, if a steel chain is to be deployed in combination with steel cable and polyester rope, the same rule applies. In order to produce a torque-matched rope, and accurately predict rope torque response, the manufacturer should build a rope model which is validated by actual rope torque testing. Deep sea mooring rope manufacturer Bexco has developed and validated such a model deploying a state-of-the art test bench (Fig. 4. ), which is capable of torque-match testing it's made-to-measure DeepRope to ensure it has the same twist behaviour in operating conditions as its steel equivalent. To achieve torque-matching over a wide tension range, it is necessary to build a rope from multiple parallel sub-ropes. By way of example, a steel wire load of 100T may be complemented by a polyester (PET) equivalent of parallel deep sea rope consisting of three 33T sub-ropes, correctly sized in terms of composition and diameter. In this example, torque-matching needs to work consistently following bedding in and should meet the ISO 'Torque Matched' requirement from 0 to 55 per cent MBL at a minimum. To ensure a correctly configured, made-to-measure deep sea mooring solution using fibre rope and steel wire which is also torque-matched, both manufacturer and EPC needs to consider the entire configuration. The combination of both polyester and steel rope will provide a durable deepwater mooring solution provided that the torque-matching is ensured over a wide range to handle day -to-day operation as well as in storm conditions. The increased focus on the interaction between steel wire and polyester ropes has also come to the attention of certification companies, who have now included in their latest regulations that torque-match testing is mandatory when synthetic ropes are used in combination with steel wire. This means that certified torque-matched ropes will become more commonplace. This will be a positive development, given the greater longevity of use that will come as a result of the initial torque-matched installations and the subsequent growth potential of this particular segment of the market.